Do you miss our last Twitter party? Well, no worries because we’ve set up another one for you just in time for the holidays! We’ve also partnered up with Plaid Crafts to do it! So if you love Mod Podge, Martha Stewart paint, and crafting ornaments for the holidays, you won’t want to miss our little holiday chat. Bring your tinsel! 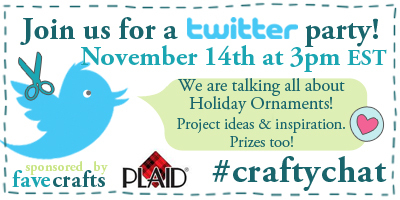 We’ll be chatting about crafting for the holidays so bring your best ideas and tricks. No ideas lined up for handmade holiday decor yet? No worries! That’s what this chat is all about. We’ll be chatting all about homemade Christmas ornaments, holiday home decor, and your favorite crafting products to use when you’re creating your handmade holidays. Joining in a Twitter Party is very simple, and we created a How To Join a Twitter Party post to help you get started. Contest closes November 14, 2012 at 4:00p EST. 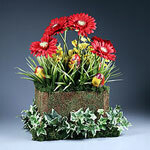 Winners will be announced during the chat. I am so excited, and hoping to get some more great ideas on home crafting holiday decorations. I think making them, is so much more inspired than just going to the store and picking something up.